I am in the process of updating this review to showcase the specification and features of the new Weber Genesis II E-330 and E-335 grills. Stay tuned! The Weber Genesis II E-330 gas grill is innovative in its own right and remains to be one of the top models. It definitely takes into account what people need and want in their gas grills, instead of just incorporating over the top features in the device. This model focuses on what is really important to users when they use their grills. Its features are directed at giving the ultimate grilling experience, with its generous cooking area and high-powered burners. For people who use their grills for cooking for larger crowds, a spacious cooking area is definitely a requirement. 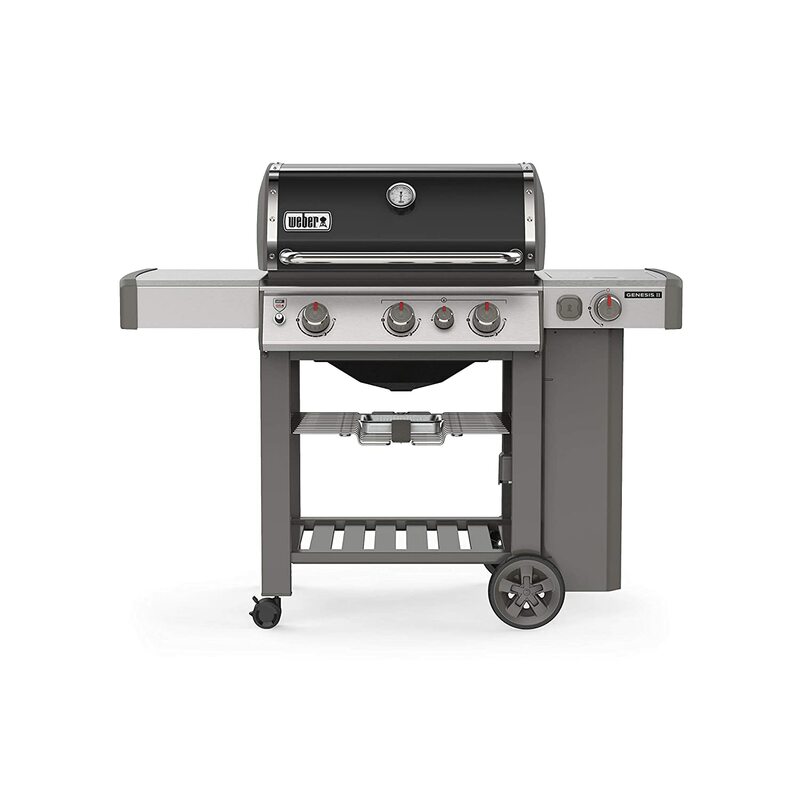 The Weber E-330 gas grill offers 507 square inches of primary cooking area and a warming rack of 130 square inches. With this, it gives you the capability to freely and comfortably cook different dishes in one go. Since the control knobs are now strategically located in the front panel (compared from previous models), the two sides are transformed into additional stainless tables for all your grilling needs. This provides you with much ample space to work around. Equipped with a high powered sear burner (10,000 BTU per hour), you can enjoy faster grilling time but not sacrificing food quality. The sear burner maintains high levels of heat to keep up with whatever you are cooking to ensure that you get the right tenderness, crisp, texture, and flavor. Genesis E330’s has three burners, controlled separately by individual ignition. With this, you can choose only to light up those burners that you need. Besides, this model also lets you do indirect cooking since its burners now run from front to back, giving you the option to maximize the heat. The overall built of this model can really say something on its quality. You just know it can last a really long time. Its frames are welded into place to provide superior strength and stability. The stainless steel burners and side tables are carefully thought out not to rust quickly. The whole machine is supported by four moveable wheels so that you can easily transport it wherever in your house. The control knobs are strategically placed in front of the unit for smooth operation and monitoring. Also, there is a precision fuel gauge so you can keep track of your fuel level at all times. Genesis II E-330 is 62 inches tall, 59 inches wide, and 31 inches deep. This is an average size for a natural gas grill. You can easily fit this into your garden, lawn, swimming area, or garage, so placing it in your home definitely won’t cause a problem. If you believe that E330 is too big for you, you should check out the Weber Q3200 2 burner gas grill. Specs of old Genesis I E-330 are in the brackets. When I first published the review, the first generation Genesis E330 was available in 3 color options of black, copper, or green. Later the manufacturer kept only the black option and moved the colors to the EP-330 premium version model (see comparison chapter below). Now the new Genesis II E-330 is again available in multiple colors. This Weber grill is available for use with Natural Gas or Liquid Propane. If you already have natural gas service at your home, get the Natural Gas E330. If not, you can get any of them. Some people say that LP E330 smoker burns hotter, but I am not sure if it is true. Before the recent model lineup update the Weber Genesis E-330 stainless steel model was called the Weber Genesis S-330. It was the same old E330 but made of stainless steel. While you could get the old Genesis I stainless steel S330 as alternative to E330, now the open cart new generation Genesis II S-330 DOES NOT exist. Right now if you want stainless steel 330-like unit, your only choice is the closed cabinet model S-335 (shown below). The main difference is the cart design. The E-335 has closed cabinet cart. EP330 was a premium version available in 5 different colors – smoke, crimson, black, green, and copper – and featuring stainless steel cooking grates. It is discontinued. If you want to read the comparison with E310, you should check out the review linked in the yellow box right below. The Genesis E330 is very well rated and received by customers. As said, people attested to how it can really cook well. You can barbecue just about anything on this machine, and expect nothing but excellent and tasty food. Many users also like that the unit comes pre-assembled, so the total assembly time is faster. People also took note of how it is priced cheaper compared to other brands, and still give you excellent grilling quality. Overall, this gas barbecue is highly recommended for anyone looking to get an outdoor smoker. This is actually a good buy, especially if you are the kind of person who uses his or her smoker every so often. This might prove to be an excellent and wise choice for a gas grill. Many people noted that Weber Genesis E330 hits all the right spots. Users can honestly attest to how it can cook and sear food beautifully, and well, deliciously. They like the design of the burners, going all the way back to front, for indirect cooking. Not all grills have such an option. Users also love the additional space below the grill and on the side tables as this made it easier and much more comfortable for them to cook. Many find the assembly to be quick and uncomplicated since most parts came pre-assembled. Its price is also considered to be reasonable, given all of its features and quality. There are very few accounts where people actually point out the drawbacks of this device. Other than the concern of the stainless steel material getting rusty (which can be avoided with proper care and cleaning), there are really no or minimal issues with this product that can break the deal for you. Some people are not happy about assembling the grill. It usually is not a big problem, because the instructions are well laid out and it should not take more than 1-2 hours even for non-technical person. Or you can contact Amazon Customer Support and ask about the availability of expert assembly program in your area. I have reviewed the 7 bestselling covers that fit the E330 here – http://isre2005.net/weber-e330-grill-cover/. Roasting at home is a delightful activity, especially if you are preparing food for the people that you love. However, in the absence of the right set of equipment and tools, this will prove to be very difficult and complicated, leading into an imperfect roast. You should make sure you choose the accessory that is perfectly fitted in the model so that it will function effectively. The Weber 7652 Rotisserie is designed for the latest Genesis II and Genesis II LX 2 and 3 burner models. When using the rotisserie, it is also essential that you do not go above the weight limit that is recommended. Then you can be assured that the motor and the rotation will work correctly and that you will end up with the right roast. Sometimes it does not necessarily need to be replaced, just cleaned. Make sure that it is cleaned every time when cooking is done. This will be easier than cleaning after a long time, or when dirt has already piled up. It is also important to remember that this rotisserie should be cleaned manually. It is small and easy to clean, therefore, will not require much effort and time to have the cleaning done. It is not dishwasher safe, so exert little effort to do the cleaning yourself. iGrill 3 is a smarphone app connected thermometer that allows you to monitor the cooking process. There are 3 more accessories available from Weber to add more variety to your cooking – the grilling basket, griddle, and sear grate. ‘Where to buy the Weber Genesis E-330 grill’ and ‘where can you find Genesis E330 best price’ are the most common questions from people ready to buy the barbecue. If you are looking for a place where you can buy Weber Genesis® E-330 Gas Grill, you will generally have two possible options: to get it from the local box store or to purchase it online. If you do not have the time to go out and shop for a grill, I suggest you to consider buying it from Amazon. Other online shops that offer the product include Walmart, Home Depot, Shop The Woz, US Appliance, Aim to Find, Gerhard’s and BestBuy, among others. Regardless of where you buy your Weber E-330 BBQ, some things should be ensured. For instance, check the covers of the warranty provided. Make sure as well that the product does not have any defect, especially when you were given the opportunity to have it inspected before purchase. Consider all possible options before finally buying this grill. Their differences lie not only on the actual price, but also on added services such as delivery, warranty, and additional items that are sold along with the actual product. Make sure to check these things before making any decision. While in absolute terms Weber 330 is not cheap, it is is reasonably priced, given all its features. Are you hoping to find Weber Genesis E-330 sale? It is not very likely because it is a new model that will not be discounted right before the grilling season. Click here to see Weber Genesis II E330 gas grill offer on Amazon! Here are a couple of pictures of old first generation Genesis 330 grills. Does it have a door? Zak, no it does not have a door. The new Genesis II E-330 features open cart design. If you are looking for a Genesis II grill with closed cabinet, check out models ending with ‘5’ like E-335, E-315, E-435 etc. Does the grill come assembled? Dustin, no it is delivered in an unassembled state. I read somewhere that Amazon offers the expert assembly program in some locations. Please reach out to Amazon customer service to find out more!